The sunny days of summer may seem like a distant memory, but as tempting as it is to let the kids curl up on the couch when they’re home, it’s important to keep them active throughout the cooler months. Even as days get shorter, you can still use those free hours to stay energetic and fuel their curiosity. Whether your child is a bookworm, an artist or an athlete, here are some tips for keeping kids’ minds and bodies active during fall and winter. The hours between lunch and dinner can give way to an afternoon energy slump. Give kids the fuel they need for afternoon activities by providing a sensible snack that’s low in sugar and a source of protein for steady energy, such as Lance sandwich crackers. Celebrating its 100th anniversary, Lance now offers Xtra Fulls sandwich crackers, which are filled with real peanut butter and deliver up to 6 grams of protein per serving. Learn more at www.Facebook.com/LanceSnacks. Dirty hands are a good thing when kids are learning to care for plants. Let your young ones plant an herb garden in a warm windowsill. First, go to the library and collect some basic gardening books. Kids can read and choose their favorite plants. Give kids different responsibilities for planting and watering to demonstrate the importance of teamwork. Even throughout the winter you can reap the rewards of fresh herbs for the dinner table. Research has found that the winter months often result in a decrease in kids’ physical activity levels. 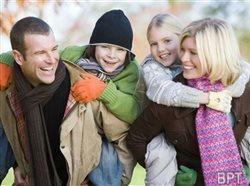 Don’t let cooler temperatures keep your family from staying active. Lots of team sports, such as football or even baseball, can be fun year-round with the right clothing. If you’re in a part of the country that gets a lot of snow, you can choose from winter sports, such as skiing, ice skating or snowshoeing to keep active. Don’t forget the best part after an active day in the cold – warming up over a hot mug of cocoa. With some paper bags, socks, glue, beads, buttons and other materials found around the house, kids can create their own puppets. Have them make favorite animals or popular characters from a beloved book. Don’t stop after the glue has dried – inspire creative play by having them enact their own puppet show. Even during the cooler months, don’t let those open afternoons and weekends go to waste. Visit www.lance.com to find more ideas for “Snacktivities” that the whole family will enjoy.